SHOE is the organizing system available in 2 models: 3, or 4 tiers, allowing you to store up to 18 pairs of shoes in only 64 cm wide. Its tubular structure coated in plastic allows shoes the correct ventilation. SHOE is a product MADE IN ITALY, the patent system is easy to assemble: it only requires a couple of minutes with no tools required. Spend that extra minute to do something else, leave the organization to SHOE. The Honey-Can-Do 18-Pair 4-Tier Wood and Metal Accessory Rack provides four levels of easily accessible storage space in a stylish and contemporary design that complements a wide range of decor styles. Featuring a natural wood frame, this rack has sturdy steel shelves that are perfect for sweaters, shoes, handbags or any items you want organized, visible and easily accessible. Perfect for a bedroom, closet, mudroom or at your front or back entrance, this rack has an elevated shelf design that holds items securely in place and is easy to assemble with no tools required. Honey Can Do SFT-01254 10-Shelf Hanging Vertical Closet Organizer, Natural Canvas. Turn a jumbled mess into a well-organized closet with our soft storage solutions. This durable piece keeps clutter at bay using every inch of available space for endless storage possibilities. This organizer has reinforced shelves for great capacity and easily attaches directly to your closet rod with hook and loop style straps. Perfect for organizing shoes and protecting them from scuffs, it can also be used for small bags and accessories. One item in Honey-Can-Do's mix and match collection of sturdy canvas closet organizers available in several colours, it's a perfect blend of economy and strength. Colour: Natural. Honey-Can-Do SHO-01818 3-Shelf Chrome Frame Canvas Shoe Rack, Charcoal. The contemporary design of this 3-tiered shoe rack is perfect for hallways, bedrooms, and closets. Sturdy, canvas fabric shelves protect your shoe collection from scuffs and scrapes while the unique design displays them with style. The chrome plated, steel construction holds up to 9 pair of shoes with ease. 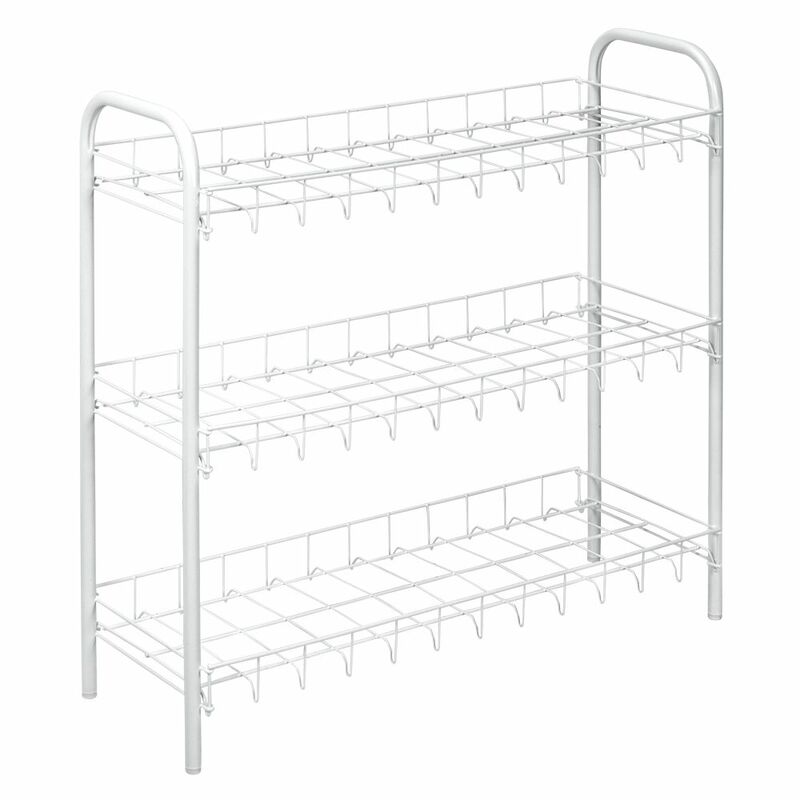 Slimmer Scarpa Shoe Rack 3-Tier 64 X 26 X 59 CM SHOE is the organizing system available in 2 models: 3, or 4 tiers, allowing you to store up to 18 pairs of shoes in only 64 cm wide. Its tubular structure coated in plastic allows shoes the correct ventilation. SHOE is a product MADE IN ITALY, the patent system is easy to assemble: it only requires a couple of minutes with no tools required. Spend that extra minute to do something else, leave the organization to SHOE.